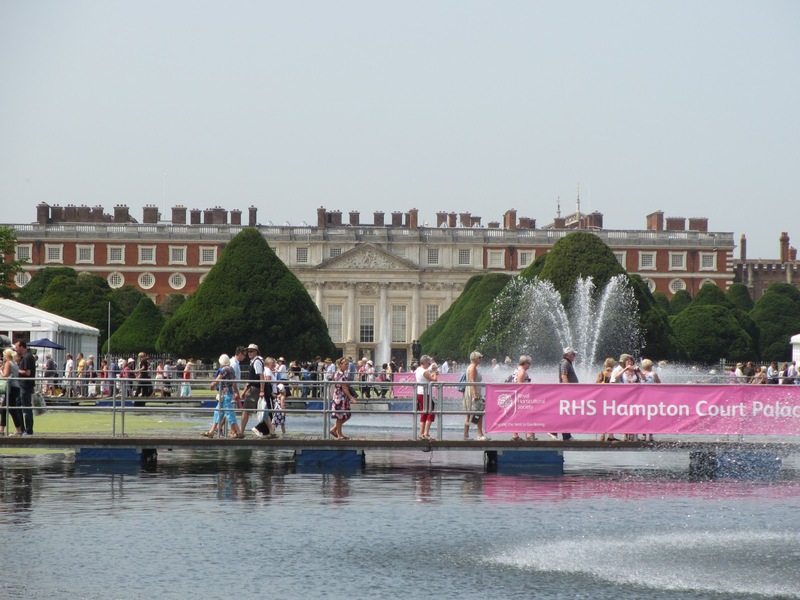 Chelsea may have bagged an annual live Royal Visitor (the Queen often makes an appearance), but Hampton Court Flower Show has the most magnificent Palace backdrop. Former home of one of our most unforgettable previous monarchs, Henry VIII. 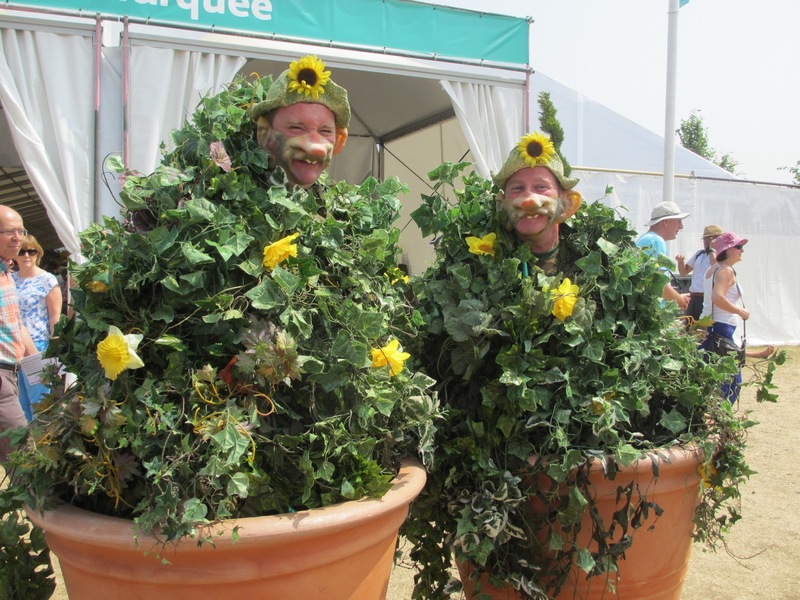 Now the biggest show of its kind in the world, the Hampton Court Palace Flower Show is run by the Royal Horticultural Society (RHS) and features show gardens, floral marquees and pavilions, talks and demonstrations. 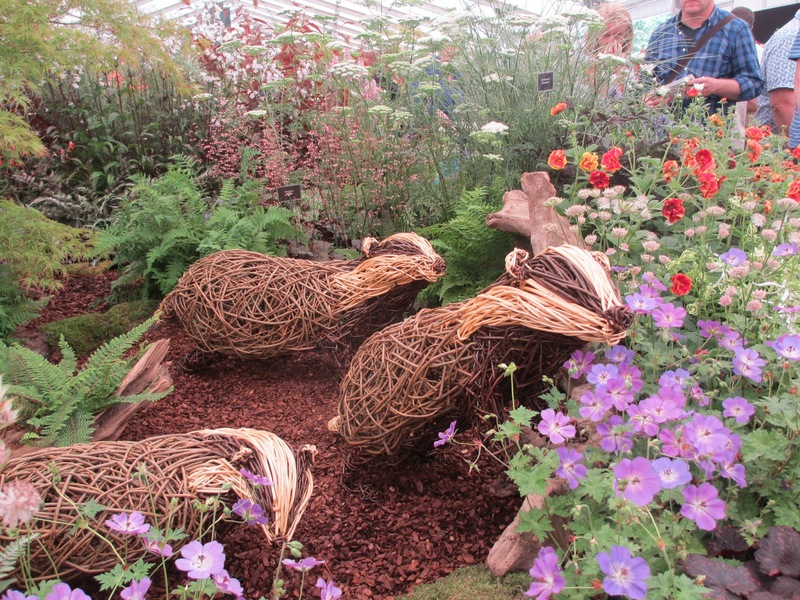 Erected on the north and south sides of the Long Water in Hampton, the show focuses more on environmental issues, growing your own food and vegetables and cookery, while also offering multiple opportunities to buy, buy, buy, garden related products of every possible invention. Desolation to regeneration which tried to depict the two phases of forest fire, through the abstract use of plant colours, forms and structural sculptures. The design was apparently inspired by the forthcoming film The Desolation of Smaug, the second installment of The Hobbit. 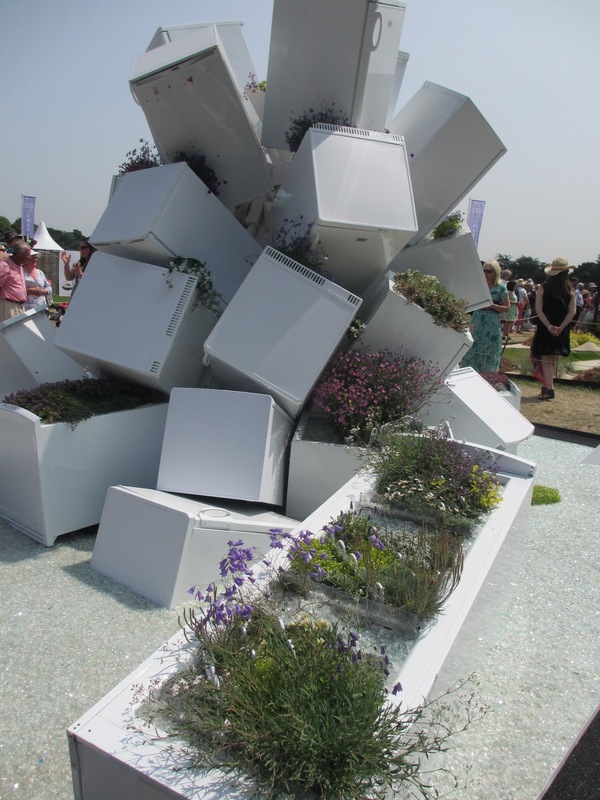 A little bit worthy perhaps, we preferred the wit of ‘Tip of Iceberg’ where alpine plants had been piled into a tower of decommissioned fridges. 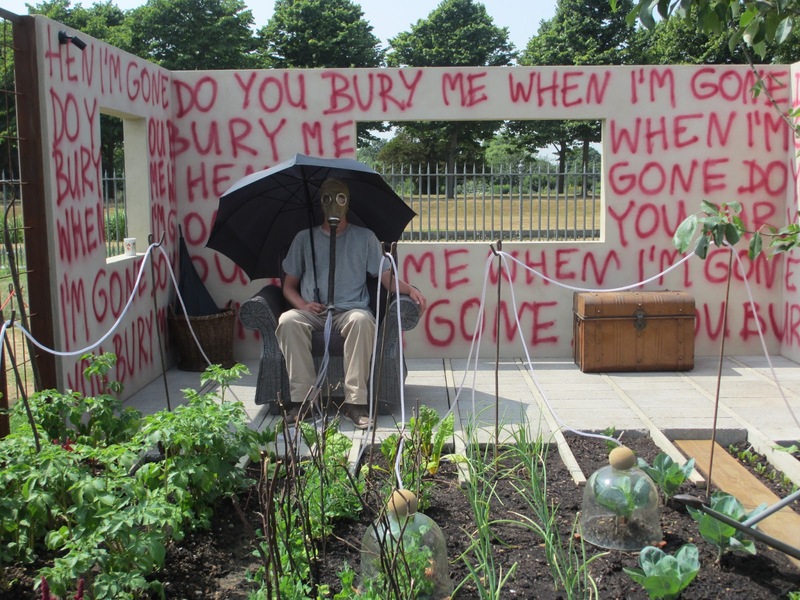 Another winner for us was ‘I Disappear’ inspired by a Metallica song whose lyrics adorned the wall of the garden where a real man in gas mask was inhaling fresh air produced from his post nuclear vegetable patch. At least I think that’s what it was meant to be, I could be wrong. He must have been awfully hot in there. 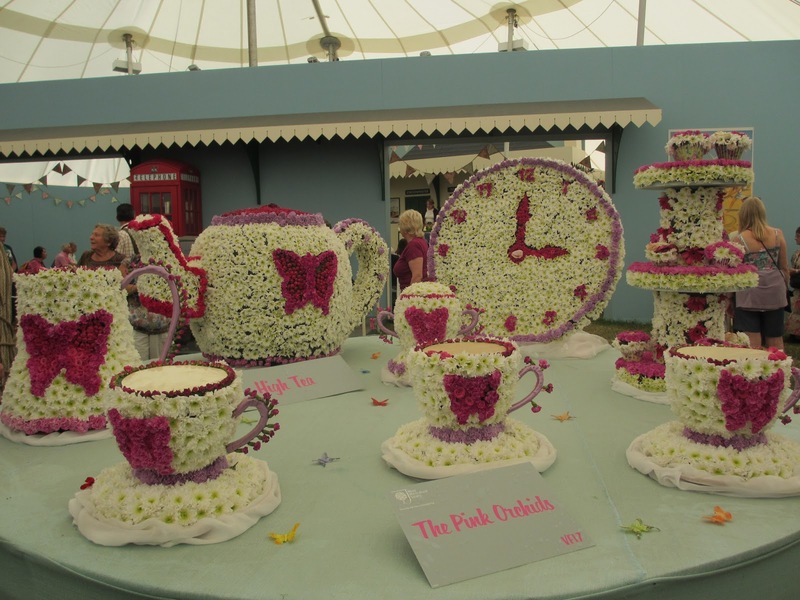 My favourite, without a doubt had to be the rose tent. The roses were nothing less than stunning and the colours and scents, simply edible. ‘Hot Chocolate’ gets my vote for ‘most gorgeous rose’ a dark, red/cocoa velvety delight. 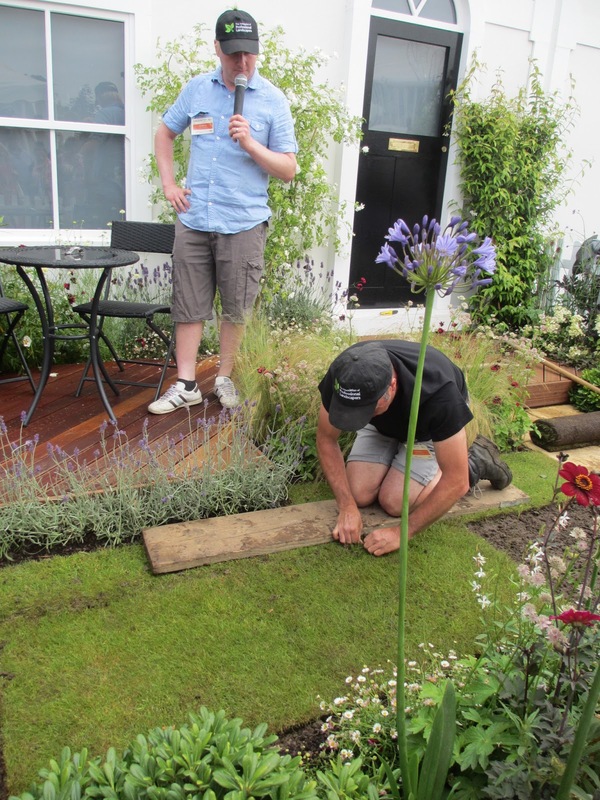 This marquee also showcased the innovative talents of Horticultural college students using the theme of 1950’s vintage which was the most fun of all the exhibits by far. 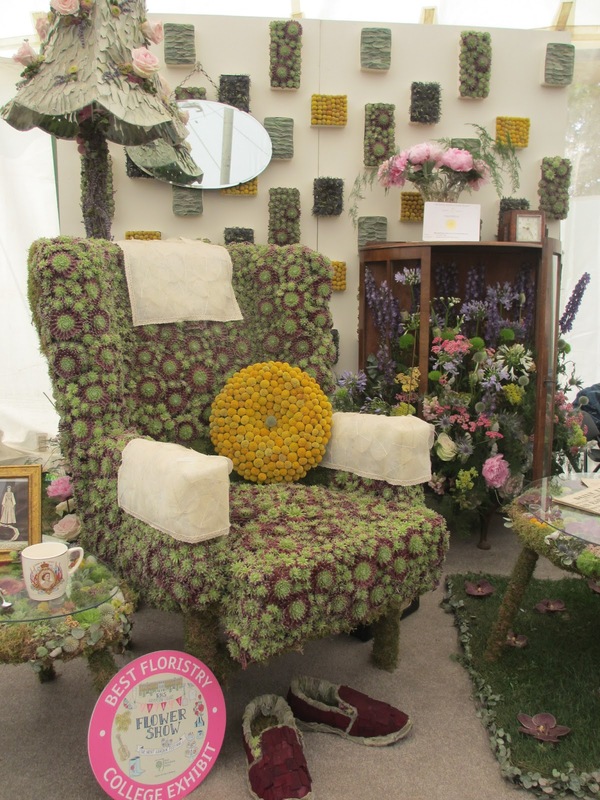 Combining jaw dropping blooms with humour and artistry we saw an entire high tea made out of flowers, a rock and roll display, Marilyn Monroe on a film set with the air blowing up her skirt – all made from flowers. 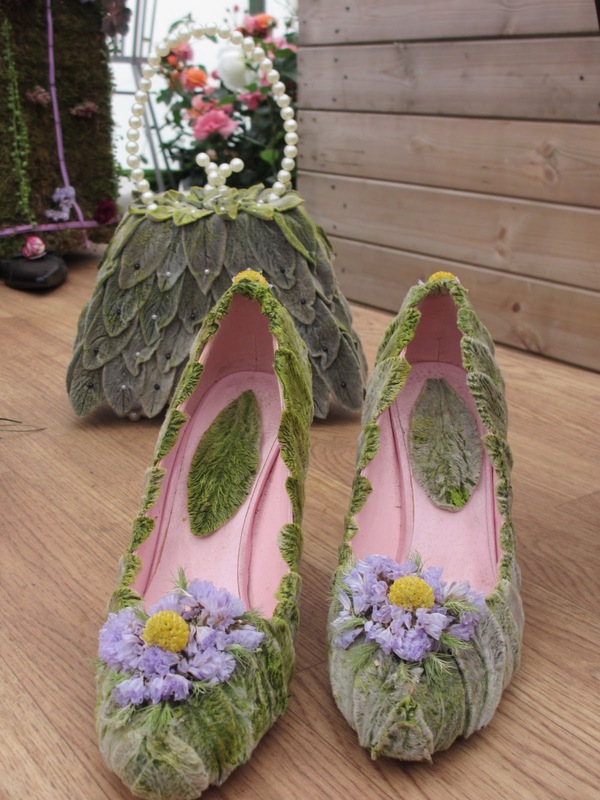 Hats and dresses and shoes were made from flowers and leaves, and the best exhibit of the whole show in my opinion was a 1950’s living room made out of sedums – armchair, slippers, pictures, fireplace – it was awesome! Our second favourite tent was the one with lots of food in it. And lots of free samples. Once we’d had six different cheeses samples (cornish blue with walnut and pear was tasty) five different bread dipped in olive tasters, four sausage samples, one premium bombay mix sample, four spoons of home made chocolate ganache with mandarin and lavender, a shot or two of elderflower gin and several samples of devilishly different fudge we knew we didn’t really need to fork out for the pricey seafood and champagne lunch everyone was queueing for. Did feel a bit sick though..The Devilishly ifferent fudge man was passionate about his fudge alright and it was indeed, quite delicious. 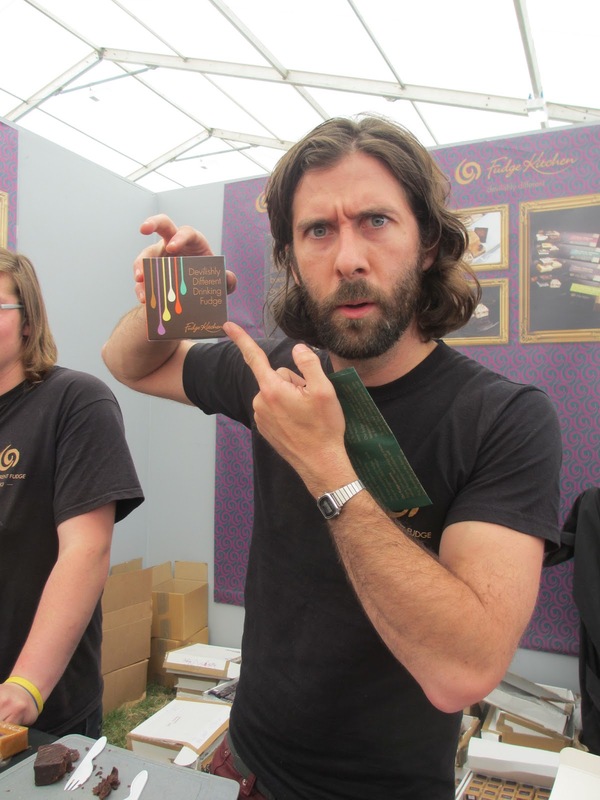 He claimed to be a master ‘Fudgeteer’ and had been training in the art of making fudge for fifteen, yes fifteen years! The best fudge making students, he explained were twenty something women who listened to instruction and were happy with the trial and error of fudge making. Men it seems go at the confectionery full steam ahead, won’t take advice, and when the fudge comes out wrong – they quickly lose interest. Remind you of anything? Previous Post:Niagara – Falls, fruit and Frankenstein..
Next Post:Montreal – the croissants are coming!